Joan S. Hickson is a very important person in the Postman Pat story. Joan is credited with transforming Ivor Wood’s TV puppet version of Pat into a two dimensional drawn character. Its really the drawn version of Pat that has inspired so many subsequent Postman Pat toy designs. 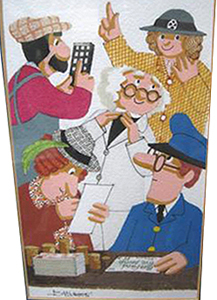 In 1982 Joan Hickson began working on a comic strip Postman Pat cartoon for the BBC children’s publication ‘Buttons’. Then, in 1985 she illustrated the first Postman Pat books by creator John Cunliffe. Hickson had studied fine art at Brighton College of Art and worked as a teacher before becoming a full time artist and Postman Pat illustrator.